We had watched a cheetah mother and her four rather large cubs lounging around in the shade of a camelthorn in the mid afternoon. Thinking that she might be disposed to hunt later in the day (following Mario and Jenny's sage advice, Page 143! ), we returned to the loop road at the Dertiende Boorgat later that day--essentially on the other side of the river bed to where we had first spotted them. Suddenly the large herd of quietly grazing springbok and one lone wildebeest took off in a mad stampede of chaos and dust. We saw one of the cubs standing around looking bewildered and we assume that the mother had missed the kill, but we were wrong. 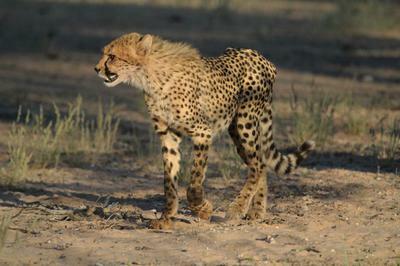 She had brought down a large male springbok, and we watched as she called cubs over to partake. We took lots of photos but the problem was that it was now 5.30 pm and we had o get back to the Mata Mata camp before 6.00, without speeding. 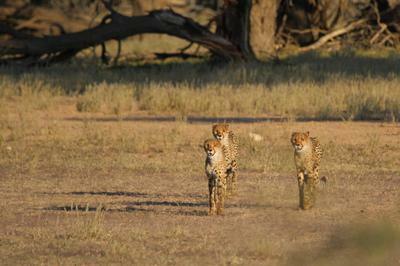 So reluctantly we left the site of the kill, but not without some lovely images of the cubs! Of course the next morning, as soon as we could, we left the camp at sunrise to go back to the site of the kill, where we saw who had claimed the last remains of the springbok--two pale southern chanting goshawks and a very fat hyena: it's a harsh life in the Kgalagadi, but nothing gets wasted! Wow! 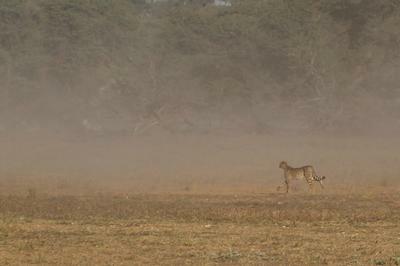 another great sighting - not many people get the chance to see a cheetah in action. Glad we could help and thanks for sharing your great pics! That's when you wish there were elephants in the Kgalagadi - your instant excuse for arriving at camp late! I always dread seeing a special sighting, like your cheetah kill, and then having to abandon it in order to get back to the camp! Thanks for sharing your experience and pics - pity about the gate closing time!